Fatigue is a highly prevalent, complex and poorly delineated symptom, which occurs before, during and after treatment for cancer. Difficulties in establishing a case definition of cancer-related fatigue have resulted in an absence of reliable and valid epidemiological data, and confound investigation into the etiology and pathogenesis of this problem. Among the possible predisposing and perpetuating factors underlying fatigue are female gender, personality factors such as neuroticism and/or a tendency toward catastrophizing, obesity, low level of activity, exposure to toxins, and prior infections. There is no evidence thus far to suggest that family history, genetic factors, or sociodemographic factors predominate. One of the most consistently evoked factors in describing the etiology of cancer fatigue is the role of cytokines. In cancer-related fatigue research, evidence and opinions support the role of cytokines, but there are also studies in which cytokine correlates were not found to be important. Anemia is a common underlying problem in cancer fatigue and can be due to cancer chemotherapy or the effects of the malignancy itself. Various therapies may have efficacy for treating cancer-related fatigue. These include exercise, mind-body interventions such as Tai chi chuan and yoga, nutritional interventions, behavioral and psychoeducational interventions, the use of antidepressants, use of erythropoietic agents, and psychostimulants such as methylphenidate hydrochloride and modafinil. Most of the current understanding of fatigue in cancer has been influenced by and largely derived from the experience of patients with breast cancer. 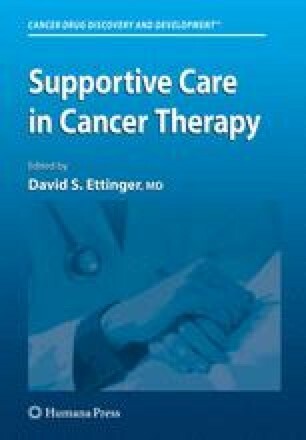 However, in the absence of an established evidence-based standard of care for the assessment and management of cancer-fatigue, further research is clearly needed, including more randomized, controlled clinical trials, research in different cancer diagnoses and treatment settings (aside from breast and prostate cancer outpatient settings); more rigorous outcomes assessment and study methodology; and discernment of dose effects and optimal frequency for dosing.